I’ve been hearing a lot about the new shingles vaccine lately and decided to find out why it’s being recommended. I know how painful shingles can be. My dad had them and he lived in pain for years after because he developed a complication called postherpetic neuralgia. His problem began when he noticed a red itchy rash on his backside just underneath the pocket that held his wallet. He thought it was simply irritated and because it was the start of a holiday weekend didn’t see his doctor. When he finally did a few days later, the rash had blistered and it hurt like you know what. He ended up in the hospital where he was given an intravenous antiviral medication that, unfortunately, didn’t offer him much comfort. The key to successful treatment is starting it right at the beginning, not waiting several days like my dad did. Three antiviral medications are currently available to treat shingles: Acyclovir (Zovirax), valacyclovir (Valtrex), and famciclovir (Famvir). They are supposed to shorten the length and severity of the illness. Pain medication, calamine lotion, and over-the-counter Capsaicin cream may help relieve pain. A cool bath or shower. Don’t use hot water because it can worsen the blisters. A colloidal oatmeal bath. Pour colloidal oatmeal into your lukewarm bathwater and soak for about 20 minutes. A cornstarch or baking soda paste. Add two parts of either to one part water and apply the paste to the rash for about 15 minutes. Mix 1/2 cup turmeric with 1 cup water. Boil at least 8 minutes to make a paste (add water if necessary). Cool before applying to your skin (turmeric stains so be careful). A few years after my dad’s ordeal began, the shingles vaccine Zostavax became available. Made from a live but weakened version of the virus that causes shingles, it was recommended for people 60 and older. 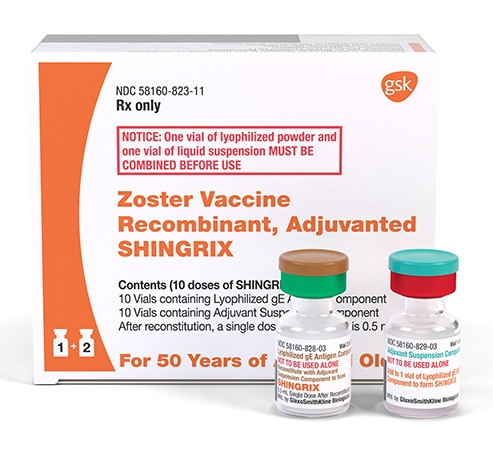 Shingrix is a recombinant vaccine, meaning it is made from a dead version of the shingles virus. Unlike Zostavax which only requires one shot, the CDC recommends two doses of Shingrix, given two to six months apart. Another difference is that Zostavax, the older vaccine, is given subcutaneously or just under the skin. The new vaccine Shingrix is supposed to be injected into a muscle. The side effects were more common in younger participants. What causes shingles and who’s at risk? Shingles is caused by the varicella-zoster virus — the same virus that causes chickenpox. If you’ve had chickenpox, the virus lies dormant in your nervous system for years, maybe forever. No one knows for sure what can trigger it to cause shingles, but some people seem to be at higher risk than others. Have weakened immune systems because of certain medical conditions, such as HIV or cancers like leukemia and lymphoma. Are on immunosuppressive drugs, such as steroids and drugs that are given after an organ transplant to prevent rejection. Are undergoing radiation or chemotherapy treatments. Stress can be a factor. “It can activate from lying dormant when you’re under some stress, whether it’s physical, emotional, or stress to your immune system — if you’re sick with something else, such as pneumonia,” said Dr. Wesolowski. When the virus is activated, it generally causes a rash that follows a pattern fitting the nerve it was hiding in. “That usually means it’s on one side of the body,” explained Dr. Wesolowski. “It doesn’t cross the middle. It’s a stripe on the trunk — chest or back. It’s easy to identify the rash because it usually fits a very neat pattern with red pimples, burning, and skin sensitivity. The rash usually heals within two to four weeks, but the pain can be pretty severe. About one in five people (like my dad) will develop postherpetic neuralgia or pain that lasts long after the rash has disappeared. Other symptoms may include fever and headache, fatigue and light sensitivity. Most cases are on the trunk, but some people get shingles on the face or head. Shingles is not contagious, but you can pass on the virus to someone who has never had chickenpox. That person won’t get shingles but may get chickenpox. While it’s usually a mild disease in children, it’s often more severe in adults. The virus can be transmitted through direct contact with the fluid in the blisters that are part of the rash. Once the blisters are dry and crusted over, which usually takes about seven to 10 days, the person is no longer contagious. You’ll find more information about Shingrix on the CDC website. You should also talk to your healthcare provider if you have any specific questions. And you should check to make sure it’s covered by your health insurance plan.